I have neglected exploring the Minam River. The Wenaha is close and it is familiar, I don’t have to worry about what I will find. I know the river well and out of habit I often go there because it is so familiar. I have thought for several years that I should explore the Minam River especially since the majority of it lies within the boundaries of the Eagle Cap Wilderness area. I made my first trip into the Minam down Rock Springs trail several years ago for a four day trip. The fishing was just so so, but I had always meant to get back and explore more. The time has come. This past weekend I made my first return visit by hiking down the Cougar Ridge Trail. I really prefer three day trips when I am hiking in somewhere or two and a half days at the worst. This allows me to hike in on Friday and get camp situated and then explore close to camp without getting in too much of a hurry, a Saturday to devote to exploring without worrying about how far I have to hike out and then a Sunday to fish and hike out if it isn’t too far or simply to hike out if it is 10 miles or more. The ideal is often not doable though and not having that much time, I hiked in late morning on Saturday. It was hot, damn hot. I had never been to Cougar Ridge, but besides Rock Springs it is one of the only short trails (around 5 miles) leading to the Minam river. I headed up Big Canyon road that follows Deer Creek. This is a good gravel road until it splits. The sign said Bearwallow trailhead was to the left, my route was to the right. The road immediately began to get worse. It was somewhat rutted and there were lots of small trees partially across the road. There began to be a lot of large rocks. If you drive to the Cougar Ridge trailhead have good tires and at least as much clearance as a standard SUV has. The upper end of the ridge is heavily wooded and I began walking through a patch of very young similar aged trees. I assume this spot was clearcut or killed off by fire in the past. The trail begins going uphill and you are quickly faced with a decision to go left or right. There are no signs, but if you go left you will head south on Cougar Ridge for about 8 miles until you meet other trails at Standley guard station. My route was to the right, heading North down the ridge into the canyon. This top section was well wooded and moderate in slope until it came to a section of ridge where it lost elevation quickly for some distance. I knew I wouldn’t like this section on the hike out. The trail began to flatten out as I began to come out of the trees onto the exposed and dry Cougar Ridge. 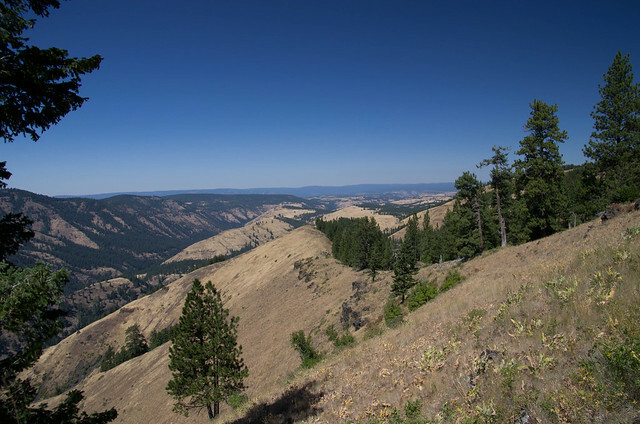 To my left was a deep canyon with Trout Creek in the bottom and Big Sheep Ridge paralleling my path. Big Sheep ridge looked pretty nice to walk. Much more of a gentle slope all the way down and trees for shade most of the way as well. Looking at my map that is a long way to the river, 17.6 miles according to my Eagle Cap Ranger District map from where you would start at Bearwallow trailhead. A little over five miles was much better for a two day trip with the intent of fishing the river. The trail down Cougar Ridge was worn heavily in places and then not even visible in others. I don’t think it sees a whole lot of use, but it has been cleared fairly recently as there was only two trees across the trail. As the ridge came closer to the river the trail got steep and especially hot as it either went straight down or zigzagged slightly down a dry rocky path. My original plan was to have my wife, Lottie, drop me off at the top and then I would walk the ten miles or so out to the store on Sunday. I changed my mind half ways to Minam on Saturday morning thinking that I could spend more time fishing and exploring the river on Sunday if I hiked back out Cougar ridge. On my way down the hot exposed ridge, I had no desire to hike back up the next afternoon in searing heat. I made a plan C at that point. I had bought a new Delorme PN60W GPS with SPOT. The SPOT satellite communicator was supposed to allow me to send one way SOS or text messages out. Although I have had it for several months I have never turned it on or read the user manual. I decided I would turn it on tonight and figure out how to send a text message, asking my wife to please come get my vehicle from the Cougar Ridge trailhead as I would be walking out to Minam late Sunday. Feeling a little relieved that I would not have to walk up that ridge in the heat, I bore the heat I was in a little easier. After the hot zigzag down the exposed part of the ridge the trail once again entered timber near the bottom and life began to feel a little better. Soon I was to the river and my heart felt good at the site of the pristine looking clear water. The Minam also has a slightly prettier river bed than the Wenaha since there are some granite rocks to add an extra bit of color. This lower end of the canyon is primarily basalt, but there are still some granite boulders that have worked their way down from higher up the drainage. I took my pack off near the river and found some shade to eat my lunch. The shade kept moving though and by the time I was finished eating I had moved with the shade about 50 feet up river from my pack. I found a shady looking spot to make camp a little downstream and then decided it was warm enough that I would simply wet wade rather than wear my waders. My last trip into the Minam several years ago had been a little disappointing from the fishing end of things. It was early September and the first day I had fished my way 4 miles downstream from the Little Minam River. I found few fish and the river didn’t seem to offer much depth or cover for fish but for an occasional piece of bedrock or deep bend every mile or so. The river had looked very promising to me where I had camped just downstream of the Little Minam. The river was full of boulders and I thought fish would be all around these boulders. I only found little 3” fish that would continually attack dry flies through this section. Going upstream the next day the river emerged from the boulder section into wide shallow flats, even more disappointing from a fishing perspective although it appeared to make for good Chinook spawning grounds. Again I found a spot with a little more depth every mile or so that provided slightly better fishing. The third day I was up close to the Minam Lodge and Red’s Horse Ranch and the fishing did improve some. Getting above Red’s the character of the canyon also began to change. I began seeing large (car or house sized) granite boulders and the river began to make pools and runs with cover and depth for fish. Back to the present below Cougar Ridge, I was finding a canyon that was somewhere in between the continuous wide shallow flats of the Minam just a little upriver and the nice pools and runs created by bedrock of the Wenaha. The river right around the bottom of the Cougar Ridge trail was really pretty decent and I was happy to find many spots with some depth created either by bedrock or large boulders that had fallen into the river. The water was not real cold though and my thermometer was reading in the low 60 degree range. As a reference to the Wenaha, I would compare this to the Hoodoo section of the Wenaha for warmer, but not terribly warm water temperatures in late summer. The river was much wider than the Wenaha though. As I walked its banks I wondered whether the shallow water was a natural product of the geology or caused by lots of logs being floated down the river in years past. Either way I thought it would do some good if someone could drop some trees or large boulders into the river to create more structure and more depth. I also noticed this section of the Minam has few cased caddis clinging to the rocks compared to the Wenaha, but perhaps the Wenaha is above average in that respect. As for the fishing, it was OK, but not great. Each decent looking spot offered a couple of rainbows in the 8”-10” range and I landed one bull trout that was bigger than the rainbows. I was switching my flies often as I thought there should probably have been more fish. Changing the fly patterns didn’t seem to make much difference, but the fish did like the stonefly patterns perhaps slightly better than the other nymphs and dryflies. I saw an occasional large stonefly from a distance, but never more than one or two here and there. There were, however, a good number of newer stonefly shucks on the rocks. Back to camp, as the evening drew near I got out my Delorme GPS and SPOT to try and figure out how to send my wife a text message. No luck though, it would only let me send an emergency SOS message that would also notify emergency services. I quickly decided against that and reluctantly decided I would make the hike out Cougar Ridge the next day. I should really read the manual and figure out how to use that thing if I am going to pack it I guess. I brought my border collie Molly with me again and she only tried to sleep on my head a couple times during the night. So it wasn’t too bad. I am not sure what the appeal of my head is when we are camping because at home she sleeps on the floor. As I again didn’t have any cougars ambush me this weekend I will credit her for adding an extra body and scaring them off whether she did or not. Sunday I made my way downstream and found decent water close to camp. It was average sized rainbows again and not lots of them. If there was this much water on Joseph Creek, there would be rainbows everywhere and probably some big ones to boot. If it were the Wenaha, it would probably be full of big bull trout. I would like to know what exactly makes a good fishery. 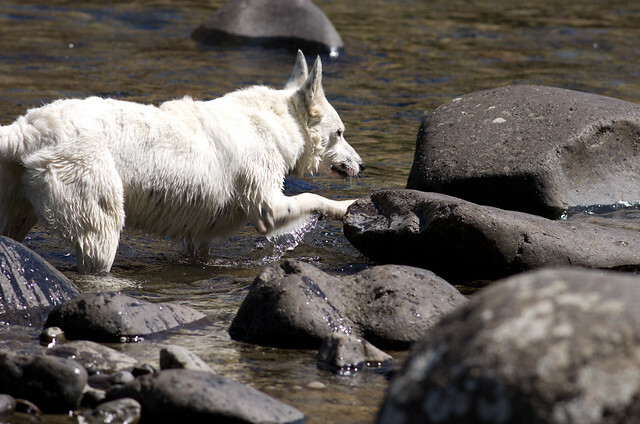 The Wenaha is pristine, cold, narrower, and deeper through most of its reach. Even the lower parts in the Wilderness area that get too warm for lots of bull trout in late summer will hold nice rainbows. I actually think once the bigger bulls move out of a section of water on the Wenaha, the rainbow fishing tends to improve. I suspect that the rainbows were probably taking less than prime feeding holds and once the bigger fish have moved on, they take up these better feeding areas. Joseph Creek is really too warm in summer and rather skinny as well, yet it probably has a much higher density of trout than most other rivers in the region, especially this section of the Minam. The Wenaha has abundant caddis and cold water, Joseph Creek has water too warm for Bull Trout or Salmon, but large numbers of crawdad. Perhaps I will have to keep a rainbow from Joseph Creek sometime and see if its belly is stuffed full of crawdads. Right by my camp was a dead Chinook partially eaten by some critter. The Chinook was only partially out of the water, but I gave her a little nudge to submerge her the rest of the way so Molly wouldn’t be tempted to eat or roll on the dead fish. I suspect I hooked a Chinook a little downstream as well. There was a large car sized boulder that forced the water down into the gravel creating a nice deep, slower lane for fish to hold. I cast a flashback stonefly and a stubby stone up along the boulder while I was positioned well downstream. My nymphs stopped and I set the hook. Nothing, so I pulled a little more and some leviathan began to move. Chinook are about the only thing I hook that act in that way. I had hopes of a large rainbow or bull, but in the back of my mind I know that it was a Chinook. My fly pulled free and I never did get a glimpse of anything. In the early afternoon I fished a similar kind of spot and once again hooked a large fish. This time the fish came to the surface and I got to see the olive green back with large black spots before my copper john pulled loose. Who knew that Chinook liked Copper John’s? That is the way I have hooked Chinook though, with the most common trout flies you can imagine: woolly buggers, Czech nymphs, copper johns, and stonefly patterns. They are not much fun though, it is like having a small log tied to the end of you line. If I ever see one chasing my flies I pull them away as quickly as I can to avoid a hook up. As the Minam River got closer to Meads Flat and the end of the Wilderness area it again widened and became shallow. I walked a ways downstream to see if it changed before turning back towards camp but found nothing of note. In my poor planning I took my water bladder out of my backpack since I was planning on hiking out to Minam along the river. Now that it was hot out and I had to make my way up a steep, exposed ridge I really was cussing myself for taking the bladder out. Back to camp I began drinking a lot of water to try and get myself hydrated for the hike out. I was thinking that I would begin my hike out in early afternoon so I could get home at a decent time, but I couldn’t bring myself to start out in the heat. I tried to rest and take a nap in my tent, but bald faced hornets kept coming in and pestering me along with some sort of horse fly. I left the tent to the buzzing insects and found some shade and sand closer to the river where I continued to drink water and read an old issue of Northwest Fly Fishing. By 4:30 it hadn’t gotten any cooler, but I thought I had better start the hike out. Molly and I were out of the shade of the trees much too soon and exposed to the sun. The ridge is the steepest here as well which only adds to the heat. I began to worry a little about Molly as she began to lag behind and I had to wait for her. She is a border collie and I have only known her to slow down when her body is coming close to its limits in some way. She frankly usually outpaces me 3 to 1. I slowed my pace a little and began stopping in each spot where there was a breeze. I also stood in the sun to give her some shade in hopes she could cool off a little better. Eventually we progressed to the top of the ridge where there was more shade, wind, and the temperatures began to get cooler. Molly was soon outpacing me again and I didn’t feel too bad for her as I was beginning to wear down from the heat. Typical of my poor planning, or more accurately, lack of planning on this trip I had not looked to see what kind of elevation change there was on the hike out. From the river to the highest point on the trail was a 2,800 feet gain in elevation. The trail is a little over five miles and the elevation gain would be much better if it were more gradual. Instead there are two really steep sections (one near the bottom and one near the top) with the rest of the trail being pretty gradual. I have a book on all the trails in the Eagle Cap Wilderness and it lists the trail as “Strenuous”, something I didn’t bother to check until getting back. I eventually made it out, but the heat and the “strenuous” trail took its toll on me. Thank you. I enjoyed your take on the Minam. I’ve fished above Red’s and done pretty well. This last weekend my wife and I flew into the Minam Lodge for a surprise birthday party. Fishing down from the Lodge was slow. I didn’t have much time, but I did catch one really nice rainbow and it made my day. I am glad to hear you are still getting in there to enjoy it. How far upstream have you gone from Red’s? The other time I hiked into the Minam, the fishing improved from the lodge upstream. I need to hike in there earlier in the year as well for another perspective since I have only fished it in late summer.